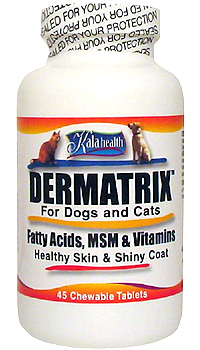 DERMATRIX is a great tasting fatty acid supplement containing all the nutrients needed to promote a healthy skin and shiny coat, and reduce excessive shedding in dogs, cats and other companion animals. It contains a high concentration of Omega 3, 6 and 9 essential fatty acids (EFA) from plant and fish sources, MSM (methylsulfonylmethane), vitamins and minerals important for skin and fur health. Daily supplementation with DERMATRIX prevents nutrition deficiencies which may result in many skin allergies, lackluster coats and unwanted shedding in dogs and cats. DERMATRIX reduces itchiness and/or dull coat in pets due to many skin conditions, paw chewing and allergic reactions including atopic dermatitis. *They are scored so it is easy to break them for smaller pets. Porcine Palatability Enhancer, Dextrates, Poultry Liver, Calcium Carbonate, Silicon Dioxide, Stearic Acid. MSM (methylsulfonylmethane): 99.9% pure OptiMSM: 200 mg/tablet. MSM (organic sulfur) helps maintain overall nutritional body balance, and promotes wound healing. Sulfur is required for the production of collagen and keratin, both essential proteins for the maintenance of healthy skin/coat. MSM fights allergy- related dermatological disorders and dry, scaly or itching skin. EFA (Essential Fatty Acids): DERMATRIX contains high-quality human-grade ingredients. EFA’s correct many dry skin problems and promotes shiny hair coats. They are natural anti-inflammatory agents helpful in at least 20% of allergic dogs. The proprietary mixture of EFA's contains 39 mg of Omega 3, 298 mg of Omega 6 and 50 mg of Omega 9 derived from vegetative and fish oil sources. Vitamin A (1500 IU) This nutrient plays an important role in the formation of new skin proteins such as collagen, and in regulating the rate of new cell development. It also protects against infections. Vitamin B Complex (45 mcg B1; 20 mcg B2, 30 mcg B6 and 0.2 mcg B12): This vital nutrient complex is required for proper immune performance, energy production, and manufacture of skin proteins. Vitamin E (10 IU). An antioxidant helpful with allergies, the immune system, and as a natural preservative. Zinc (5 mg): an important mineral for healthy skin and for maintaining immune functions. 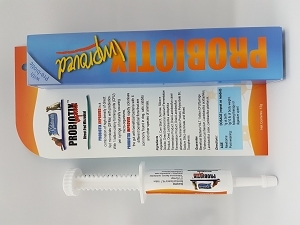 DERMATRIX for Dogs and Cats is available in bottles containing 45 and 180 chewable treats.